Music lesson vouchers. Learn Guitar, Drums, Bass, Ukulele at the Yorkshire Academy of Modern Music in Barnsley and Wakefield. Sheffield, Huddersfield, Leeds. 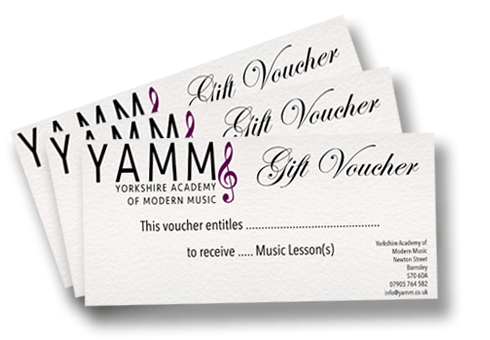 Music vouchers, lesson vouchers, instrument vouchers, music experience, music gift. Gift Vouchers make the perfect present for a loved one. Christmas vouchers are available to purchase all year! You can buy online using the link below or call in to our Teaching Studios at Barnsley or Wakefield. Please call ahead to guarantee a member of staff will be available. PLEASE NOTE – Time slots are allocated on a first come first serve basis based on date of registration not date of gift voucher purchase. The Yorkshire Academy of Modern Music will do their best to accommodate the student’s requests. We also do not refund gift vouchers in line with other retailers.